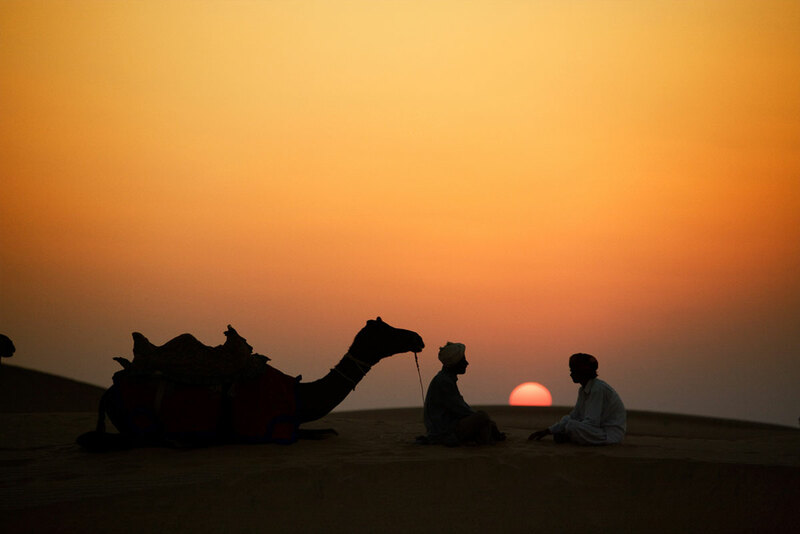 How do you describe venturing to the mind-boggling country of India? For some, the first time they touched down in this massive country called India, it might have been the best day of their life. For others, I know it has been a not so good experience. That is because for most of the country, you can’t even say that it has an organized chaos kind of feel to it. I would have to say the feel is of a much more disorganized chaos–and about as dirty as anywhere you could ever imagine. However, there is a never ending pull, a nag to keep exploring, to keep coming back that is always there. The colorful eye candy of the buildings and clothing and craziness of their transportation in every direction is what many of us photographers crave. My first time there, many years ago, weeks before venturing back to Burma, I had no idea what to expect. Of course I knew it would be different and eye-opening, and that I would probably come back with some of the best images my life. But I had no idea that this country (that I had longed to go to for years) could be so incredibly photogenic everywhere but at the same time so filthy everywhere. I’m not sure how or when, but it seems they decided that little things like trash cans are pretty useless. Hygiene in any form, a decent bathroom, or any normal sense of cleanliness is not high on their list of priorities. Sad but true. I say all of this because if you know in advance, this is a good thing. To arrive and not have been warned, let’s just say the culture shock is pretty severe. That’s why I warned the people coming on my next workshop there in November that they better know what to expect. I laid it out and said no complaining. It is what it is. It’s not America. It’s not even Cambodia. This is a country full of people who do things the way they want, so if you want to enjoy the beauty they have to offer…. then you better be prepared to experience it all. 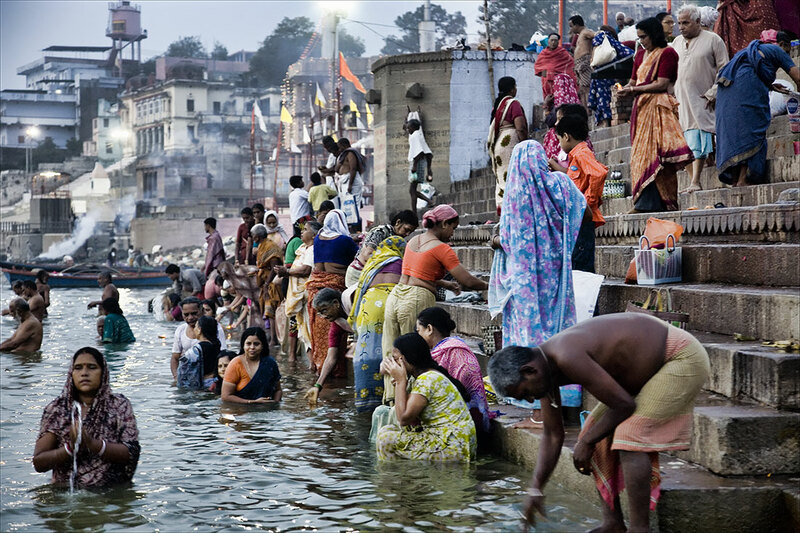 Although India is the seventh largest country in the world, it is incredibly crowded, with over 1 billion people. Only China has more people inside its borders. It also contains the world’s most populous democracy and it’s history is like nowhere else. But it is India and craziness is everywhere. The chaos on the streets is something that’s really hard to get used to, with people everywhere, but the camera absolutely loves it. From the “packed like sardines” alleyways of old Delhi, to the ancient trains that seem to be going anywhere and everywhere, to just about any major street in any major city, people are like ants at a picnic. 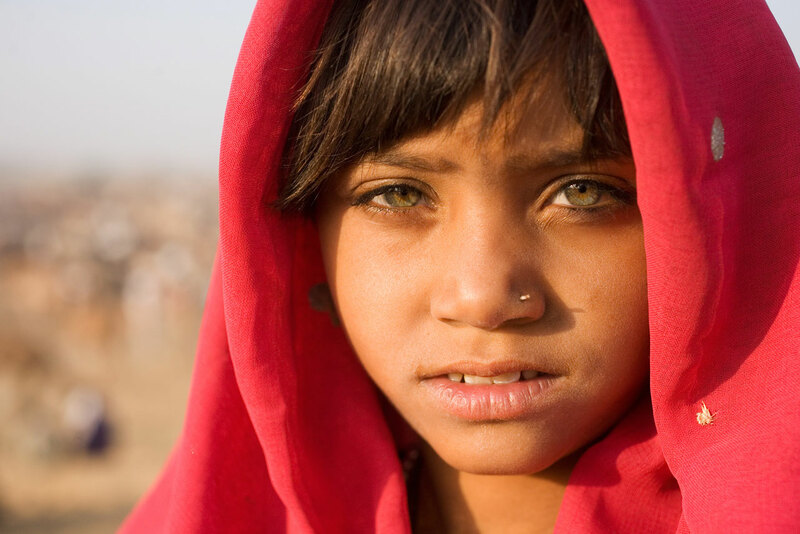 If you love photographing faces, you are going to enjoy this place! There are amazing festivals like Holi, that are seemingly everywhere, and are one of India’s highlights. The experiences and memories will last forever. 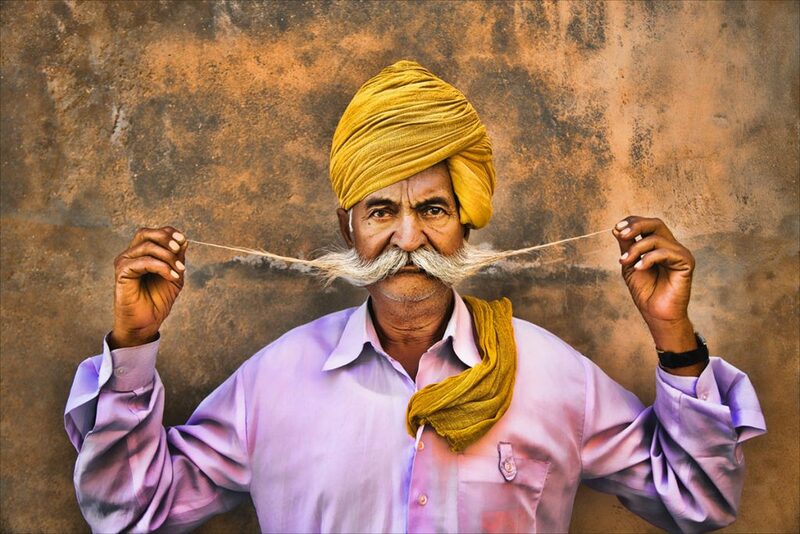 I would have to say that my favorite area to photograph is Rajasthan. 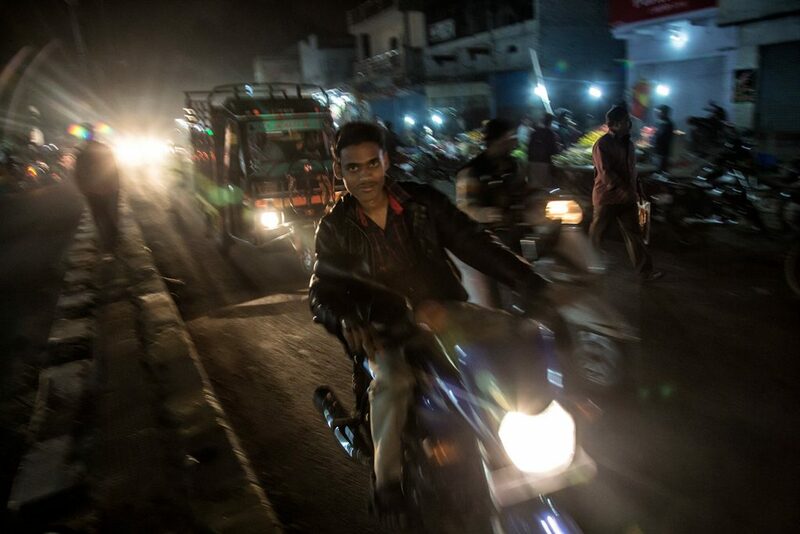 The north of India has some amazing towns that can be reached easily (but very slowly) by car. From Delhi, to Agra, to Jaipur, to Jodhpur, to even Pushkar, there is extreme culture shock as traffic and incessant car honking can drive you insane. Although some of the drives from one of these places to another might be up to seven hours, it’s really nothing compared to the vast distances from other major cities inside this incredibly huge country. In Agra, feasting your eyes on the magificent Taj Mahal, a wonder of the modern world, should be a mandatory experience for every human. 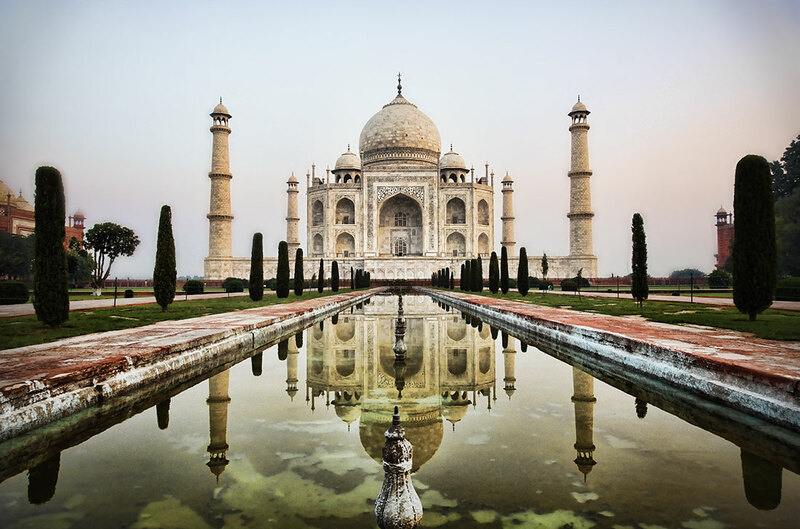 Commissioned in 1632 by the Mughal emperor, Shah Jahan, to house the tomb of his favorite wife, Mumtaz Mahal, the Taj Mahal is surreal. The tomb is the centrepiece of a 42-acre complex, which includes a mosque and a guest house, and is set in formal gardens bounded on three sides by a crenellated wall. All of this, to house his loving wife for eternity. Not sure that you can even use the word extravagant. For what he did for his wife, I think there is no word. 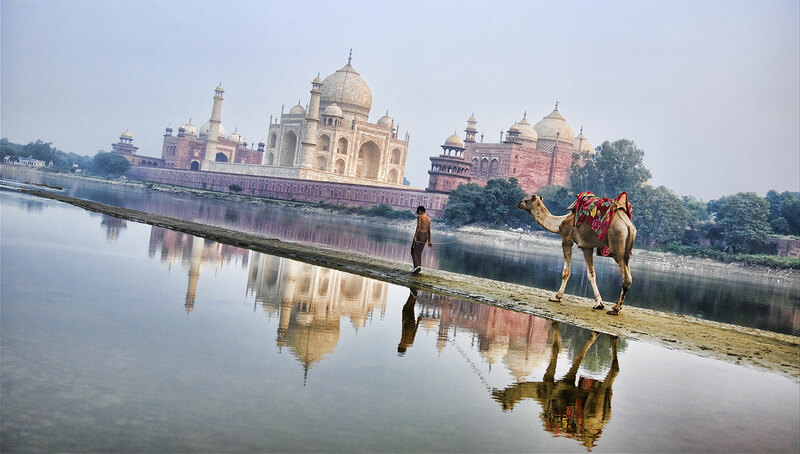 I feel lucky when I go there because one of my best little buddies lives in the village on the backside of the Taj Mahal, where I have photographed him with his camel and family, in the river behind the Taj. 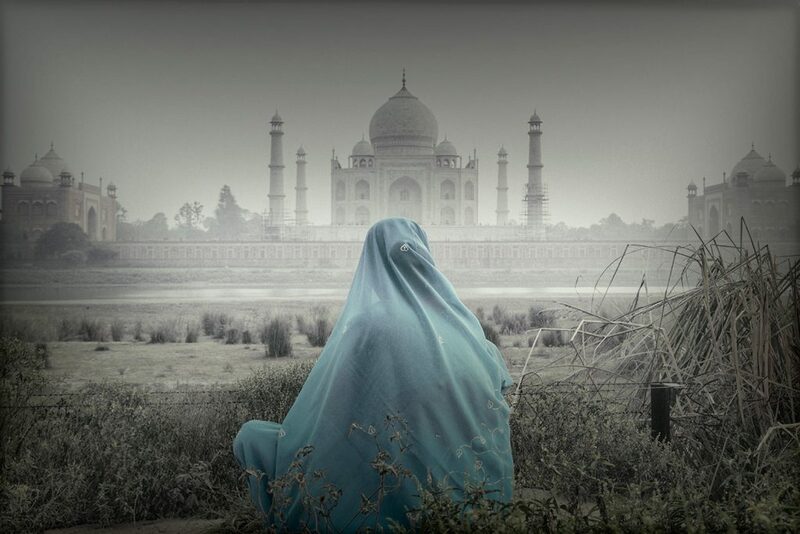 Things have changed now, for security reasons, on the backside of the Taj Mahal, but this is still one of the most beautiful places to photograph because the Taj gets so many visitors on the inside every day. I would also have to say that my favorite city in all of India is Jaipur. There’s something that just feels right, everywhere and all over. I think that’s why it is usually ranked the number one city in all of India and the seventh top city in all of Asia. And yes, there is chaos like everywhere else, but it is a place that you will always remember because there’s so much to offer. I would have to say that, for me, the painted elephants by the Amer Fort are hard to beat for best attraction. 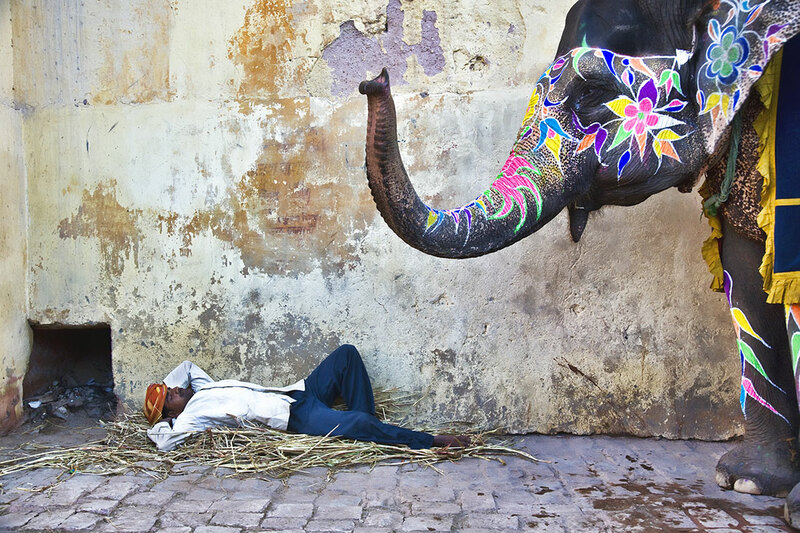 I have watched the owners and trainers paint so many elephants with their beautiful techniques. These enormous, gorgeous animals can be incredibly addicting to be around. However, riding them is a different story. 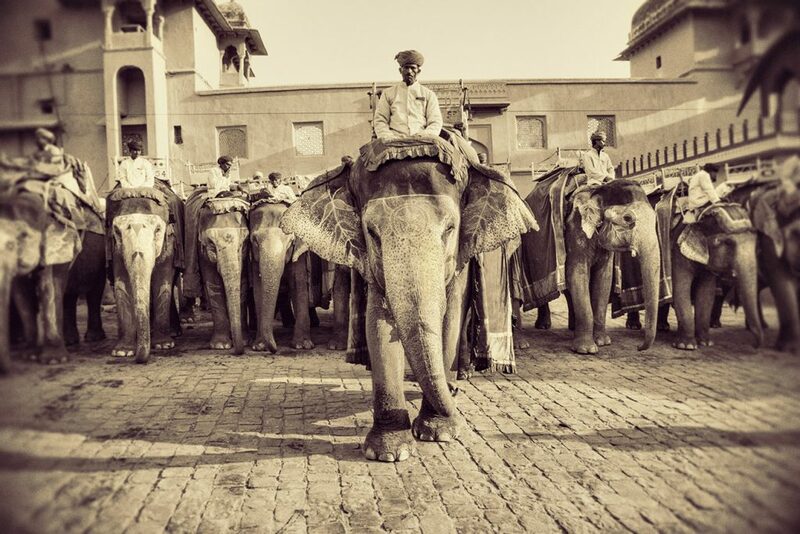 Years ago, when I first visited beautiful Jaipur, I decided to ride an elephant up to the Fort. They had me throw my camera backpack in the little box behind me, on top of the elephant. I had no idea that when these giant animals walk, they swagger from side to side, with huge steps, almost making you motion sick. Unsurprisingly, my backpack flew off, falling over seven feet to the ground. It wasn’t until when I got up to the fort and opened my gear that I realized three of my lenses had broken from the fall. Needless to say, I don’t ride those elephants anymore. However, I never grow tired of photographing them. 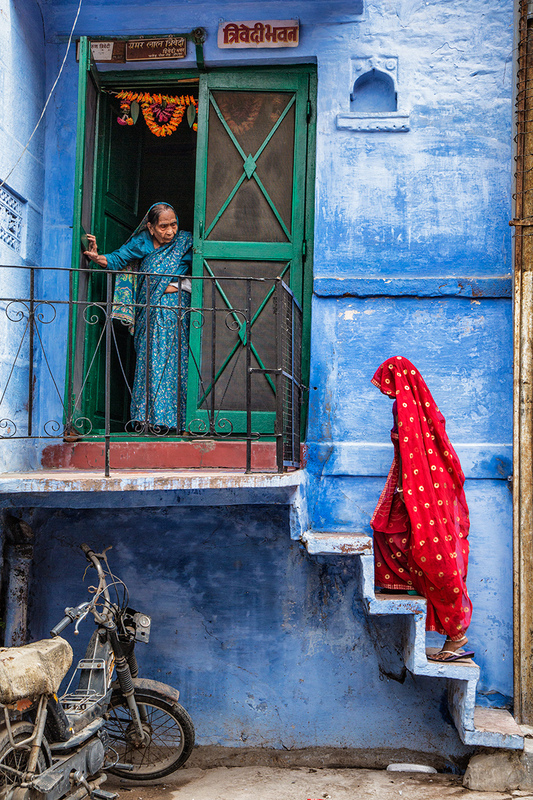 And, of course, there is the blue walled city of Jodhpur. Trying to navigate the maze of alleyways inside the blue walls is like trying to do a jigsaw puzzle blindfolded. All I can say is, good luck unless you have a guide. But I love being inside, looking for great faces and children to photograph. 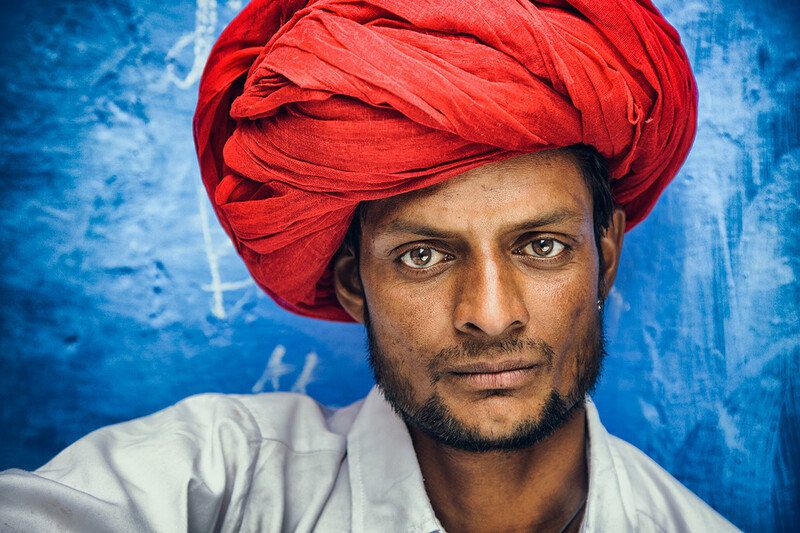 The blue walls are the perfect backdrop for these amazing faces. The view from above, looking over all of the blue, astonishing architecture, is incredibly stunning (even more so at sunrise.) I can’t wait to go back, to take in that beautiful panorama, in a couple of months with my next workshop. It is a very special place, for sure. 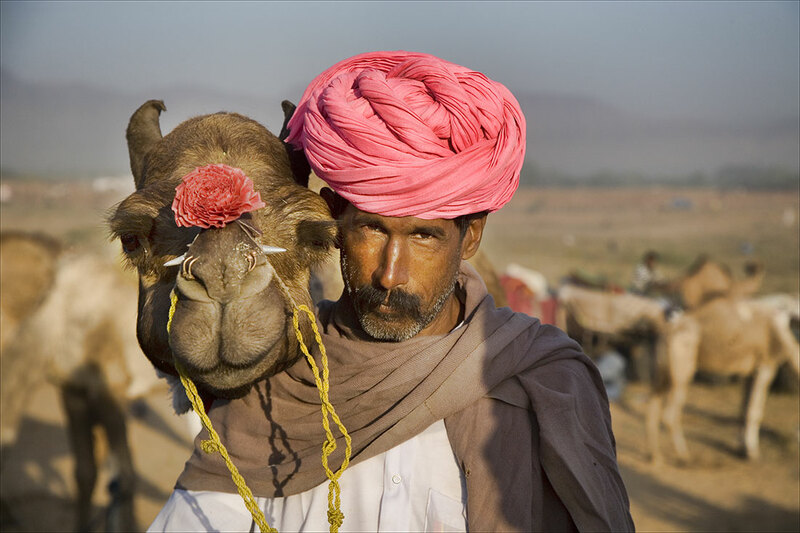 And of course, thinking of festivals, one of the most wild and photogenic is the infamous Pushkar Camel Fair. 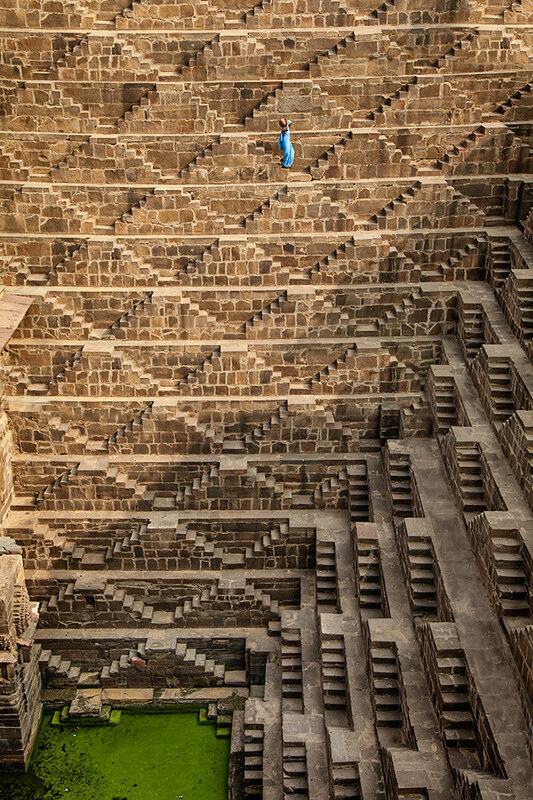 This is a spectcle on an epic scale, attracting more than 11,000 camels, horses, and cattle, and visited by over 400,000 people in a two week period. Needless to say, the photo opportunities are nonstop. Watching all of the owners trying to peddle their livestock is one of the highlights of my trips to this incredible country. I have climbed up giant water-towers to shoot the entire festival from above, and the enormity of the festival is still mind-boggling. After the sun goes down, and everyone has left but the owners and their camels and livestock, I love to photograph everyone sitting around with their legs crossed. They tell their stories and cook their meals over a campfire. I stay to take their photos every night I am there, if only to capture the addicting camaraderie between these men. I can’t believe I soon get to return to the craziness… to the to eye candy. 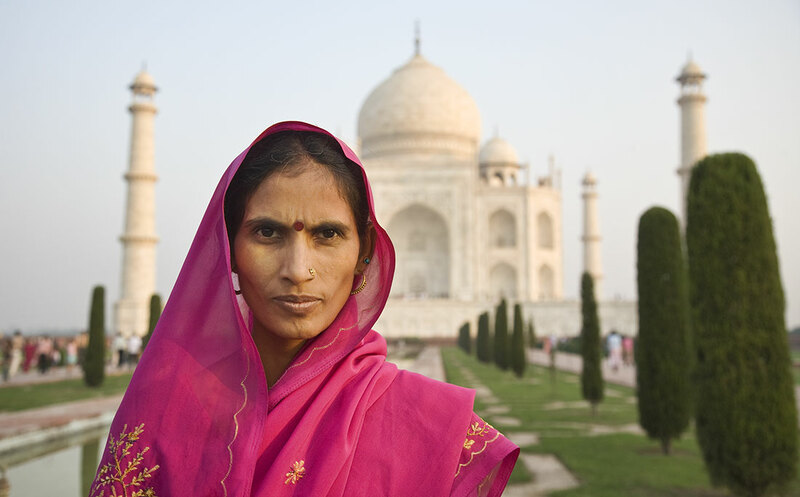 India is like nowhere else I have traveled. Although it is without a doubt the dirtiest country I’ve ever visited, it is also likely the most photogenic. Everywhere you look, everywhere you turn, every Tuk Tuk you ride in, there is practically a guarantee that you will come away with some of the best images of your life. For photography, this is the holy Grail. You have to overcome obstacles that you probably never dreamed of, and endure the urge to jump on the first plane leaving the craziness of this country. But, when you’re finally editing your images once you get home, you will be all smiles. You will know that it was all worth it. You captured once-in-a-lifetime images…. and you survived the chaos! 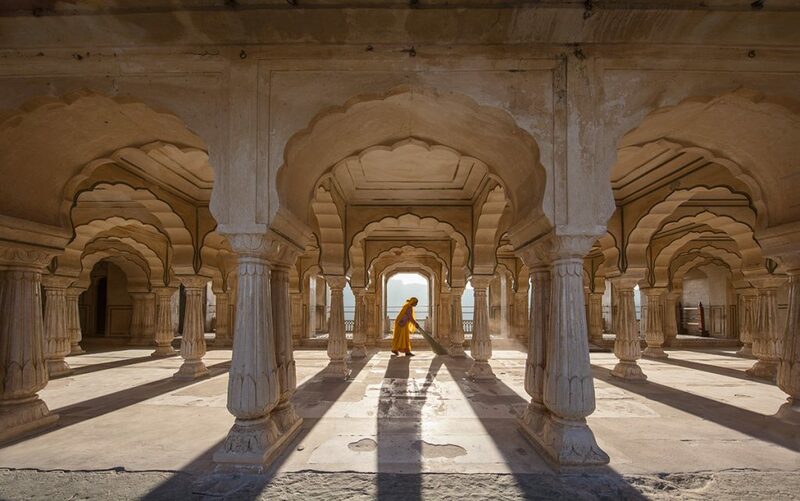 Scott Stulberg is a world-traveling photographer and teacher, with images represented by Getty and in collections worldwide including in the United Nations. You can see his photography workshops on his workshops page. Words and images ©2016 Scott Stulberg. All rights reserved. Winter Wildlife – Part 1 with Joseph M. Johnson Sr.
© Copyright 2019 Really Right Stuff.